The Lord appears to Abraham. (1-8) Sarah's unbelief reproved. (9-15) God reveals to Abraham the destruction of Sodom. (16-22) Abraham's intercession for Sodom. (23-33)1-8 Abraham was waiting to entertain any weary traveller, for inns were not to be met with as among us. While Abraham was thus sitting, he saw three men coming. These were three heavenly beings in human bodies. Some think they were all created angels; others, that one of them was the Son of God, the Angel of the covenant. Washing the feet is customary in those hot climates, where only sandals are worn. We should not be forgetful to entertain strangers, for thereby some have entertained angels unawares, #Heb 13:2|; nay, the Lord of angels himself; as we always do, when for his sake we entertain the least of his brethren. Cheerful and obliging manners in showing kindness, are great ornaments to piety. Though our condescending Lord vouchsafes not personal visits to us, yet still by his Spirit he stands at the door and knocks; when we are inclined to open, he deigns to enter; and by his gracious consolations he provides a rich feast, of which we partake with him, #Re 3:20|. 9-15 Where is Sarah thy wife? was asked. Note the answer, In the tent. Just at hand, in her proper place, occupied in her household concerns. There is nothing got by gadding. Those are most likely to receive comfort from God and his promises, who are in their proper place, and in the way of their duty, #Lu 2:8|. We are slow of heart to believe, and need line upon line to the same purport. The blessings others have from common providence, believers have from the Divine promise, which makes them very sweet, and very sure. The spiritual seed of Abraham owe their life, and joy, and hope, and all, to the promise. Sarah thinks this too good news to be true; she laughed, and therefore cannot as yet find in her heart to believe it. Sarah laughed. We might not have thought there was a difference between Sarah's laughter and Abraham's, ch. #17:17|; but He who searches the heart, saw that the one sprung from unbelief, and the other from faith. She denied that she had laughed. One sin commonly brings in another, and it is not likely we shall strictly keep to truth, when we question the Divine truth. But whom the Lord loves he will rebuke, convict, silence, and bring to repentance, and if they sin before him. 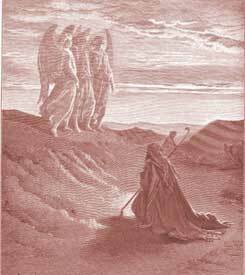 16-22 The two who are supposed to have been created angels went toward Sodom. The one who is called Jehovah throughout the chapter, continued with Abraham, and would not hide from him the thing he intended to do. Though God long forbears with sinners, from which they fancy that the Lord does not see, and does not regard; yet when the day of his wrath comes, he will look toward them. The Lord will give Abraham an opportunity to intercede with him, and shows him the reason of his conduct. Consider, as a very bright part of Abraham's character and example, that he not only prayed with his family, but he was very careful to teach and rule them well. Those who expect family blessings must make conscience of family duty. Abraham did not fill their heads with matters of doubtful dispute; but he taught them to be serious and devout in the worship of God, and to be honest in their dealings with all men. Of how few may such a character be given in our days! How little care is taken by masters of families to ground those under them in the principles of religion! Do we watch from sabbath to sabbath whether they go forward or backward? 23-33 Here is the first solemn prayer upon record in the Bible; and it is a prayer for the sparing of Sodom. Abraham prayed earnestly that Sodom might be spared, if but a few righteous persons should be found in it. Come and learn from Abraham what compassion we should feel for sinners, and how earnestly we should pray for them. We see here that the effectual, fervent prayer of a righteous man avails much. Abraham, indeed, failed in his request for the whole place, but Lot was miraculously delivered. Be encouraged then to expect, by earnest prayer, the blessing of God upon your families, your friends, your neighbourhood. To this end you must not only pray, but you must live like Abraham. He knew the Judge of all the earth would do right. He does not plead that the wicked may be spared for their own sake, or because it would be severe to destroy them, but for the sake of the righteous who might be found among them. And righteousness only can be made a plea before God. How then did Christ make intercession for transgressors? Not by blaming the Divine law, nor by alleging aught in extenuation or excuse of human guilt; but by pleading HIS OWN obedience unto death. Verses 4,5~Hospitality was a very important custom in ancient Israel. Hospitality should be important to us today. vs 19 - God's foreknowledge of Abraham's dependence upon God for good works is shown here. Abraham, will by faith, act upon the promises and truth God has given him. This chapter highlights Jehovah God's patience in dealing with Abraham. He allowed him to question him multiple times and he gave him an answer each time. Dear Jonathan; Why do you not spell out the word God? He is not offended or challenged by our unworthiness; but He rather loves us and seeks to save us! (John 3:16-17) There is a prophecy in Amos about the disobedient Jews at one point being no longer allowed to mention the LORD's Name; but it is not for us who believe and love the Name of our God and Saviour! What are your thoughts? Please write! To Marty's comment 2/2016; How does one open the Bible, and not be afraid to think and say what you said? The episode with Noah is glaringly apparent; Ham had no compunctions about looking on his father's nakedness, and no respect or fear to talk about it out loud! He was a filthy rebel in his heart, and it manifested in his descendants after him! Japheth and Shem loved and honored their father! Dear Ron; I'm so sorry to read about your sickness. I will pray for you to be healed also, and for the Lord to help you with all the strength and comfort you need. There are things I think are too hard for us in this life, and we just want to be strong and feel like we were before. It may be unbelief; it may be that we have to search our hearts and give account to God; it may be we have to wait? Ron,'what will it take for him to heal me." God wounds us and heals us for many different reasons. There is no set formula, He heals the wicked as well as the righteous, as it pleases him. Psalms;"I know that it is good for me to be afflicted, that I might learn your statutes. "Read chapter 2 Cor. 12, V.7 Paul asked him 3 times to remove the pain (thorn) in his side. Job 13:15 ,Job 23:12-16. What Do You Think of Genesis 18? When God accuses Sarah of laughing after she learns she will bear a child, what does she do?